BEAUFORT – Paula Gillikin, central sites manager for the North Carolina Coastal Reserve, was on hand in late October to monitor a salvage company remove a displaced houseboat that Hurricane Florence had washed from Taylor’s Creek onto the marsh of Rachel Carson Reserve’s Carrot Island. 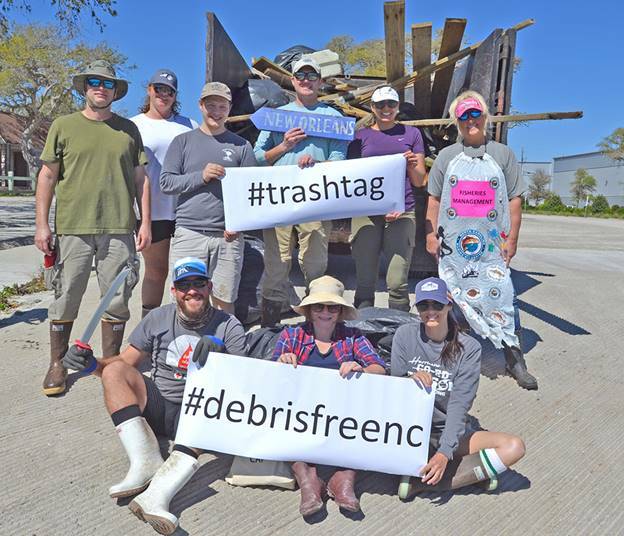 Gillikin oversees the Rachel Carson Reserve, one of 10 North Carolina Coastal Reserve and National Estuarine Research Reserve sites, a part of the North Carolina Division of Coastal Management, under the state Department of Environmental Quality. The North Carolina National Estuarine Research Reserve is managed through a federal-state partnership between the National Oceanic and Atmospheric Administration and the state Division of Coastal Management. After Hurricane Florence, the U.S. Coast Guard during a statewide survey flagged 383 vessels requiring salvage for hazardous materials response. Over the long term, these vessels can affect fisheries and marine habitats, lead to complaints about wreckage and garbage waste and hurt coastal tourism, according to information presented Tuesday to the Joint Legislative Oversight Committee on Agriculture and Natural and Economic Resources. The presentation noted the Emergency Support Function 10, or ESF 10 – Oil and Hazardous Materials Response, which provides federal support in response to an actual or potential discharge and uncontrolled release of oil or hazardous materials when activated, according to the Federal Emergency Management Agency website. Legislators in attendance Tuesday agreed with the presenters from Atlantic Coast Marine Group who suggested the state should look into requiring boat owners to carry liability insurance sufficient to cover the state’s cost of salvage and environmental mitigation. 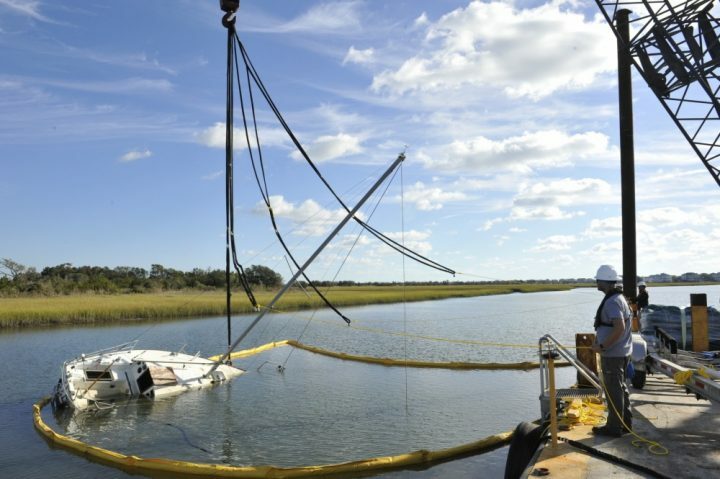 Gillikin, on that brisk Saturday morning in late October while standing watch over the vessel relocation, said that the large-scale salvage company, Resolve Marine Group, had been working with the Coast Guard on vessel removal for the post-Hurricane Florence FEMA-funded effort. She noted the company’s expertise and equipment to protect the environment from pollution threats. “The company uses what we call a number of environmental best management practices wherever they can,” she said. The crew from Resolve spent the morning situating large, ship-launching airbags under the houseboat to inflate and then lift the vessel for removal, with the goal to limit further damage to the sensitive habitat. “We’re making really careful decisions about what we’re doing with vessels,” Gillikin said. Coast Guard Petty Officer 3rd Class Brandon Hillard, who spent time with Gillikin on Carrot Island during the salvage operation, explained that the state requested the Coast Guard relocate several vessels that were displaced or sunken in environmentally sensitive areas. 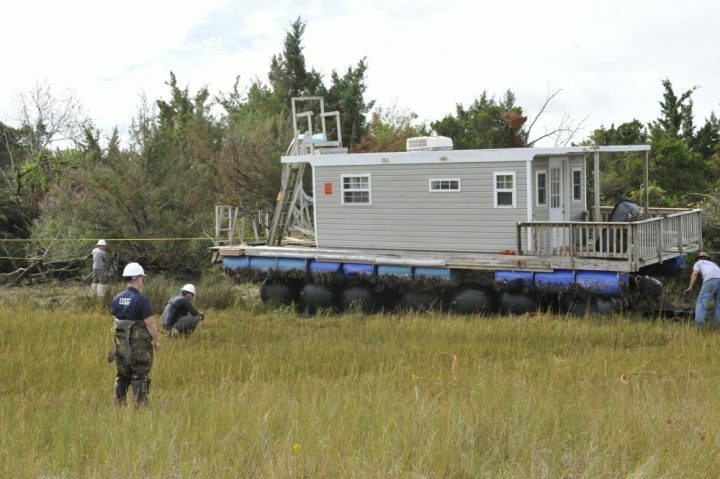 The Coast Guard worked with the North Carolina Wildlife Resources Commission, DEQ and other agencies including NOAA, and Resolve to provide federal oversight, personnel and portable work spaces. Sarah Young, public information officer with DEQ, said that of the 10 reserve sites, vessels are most often grounded at the Rachel Carson and Masonboro Island reserves, given the proximity of these sites to heavily used waterways and local anchorages. “Vessels commonly come ashore at one or both of these sites during storm events, including hurricanes, nor’easters, and king tide events. 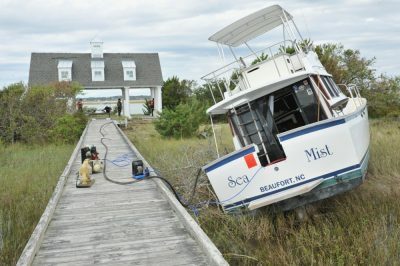 If vessels are displaced in larger numbers, it is usually associated with a hurricane,” she said. The burden on state resources varies depending how the vessel was displaced, Young said. There are several steps that must be taken to have the vessels removed from the reserves. The reserve first collects information about the vessel and its location, especially if it’s in a sensitive habitat, and often works with municipalities and the Wildlife Resources Commission to find its owners, determine their salvage plans and to advise them that salvage should be conducted to minimize environmental impacts, Young continued. “If the owner is unresponsive and gives up interest in the vessel, the vessel can eventually be removed from the reserve property if funding resources are available. However, this process can be a long one because the state does not have a specific policy that governs removal, disposal, and dedicated and sustained funding to support such efforts,” she said. The mission of ESF 10 is to prevent, minimize or mitigate the release of pollutants and hazardous materials in the environment, which sometimes includes vessel relocations as determined by the state. These pollutants included gasoline, diesel, oil, flares, fire extinguishers and chemical containers. “Vessels that were actively discharging pollutants such as fuel were, of course, a top priority to be mitigated,” Hillard said. The state then decides how and when the vessels themselves may be removed if they are not claimed. Hillard said that the ESF 10 Unified Command, which is made up of state and federal agencies including the Coast Guard, was given up to a $10 million mission assignment through FEMA and has acted in support of the state to mitigate pollution threats, but not to remove debris. “Salvage is a complex operation and many factors can affect the cost of operations, such as the size of vessel, sensitivity of habitat, amount of pollution on the displaced vessel, ease of access to the vessel, assets available and weather conditions during operations,” he said. Legislative reporter Kirk Ross contributed to this report.